Studio: Nina Holiday Entertainment, Swirl Films, Tri Destined Studios, GMC TV. Cast: Lamman Rucker (Sebastian), Denise Boutté (Ryan), Terri J. Vaughn (Kai), LeToya Luckett (Rose), Ahmed Lucan (Forrest), Angie Stone, Darian “Big Tigger” Morgan (Rod), David Banner (Sidney), Nicole Eggert (Paige), Tommy Ford, Karon Joseph Riley (Dale), Shirley Strawberry, Kandi Burruss, Trina Braxton. 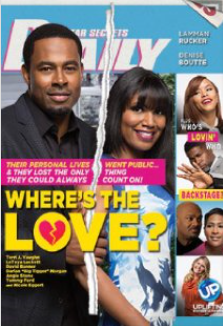 Story: It is the one-year anniversary of the talk show Where’s The Love? hosted by married relationship experts and doctors Sebastian (Lamman Rucker) and Ryan Reid (Denise Boutté). They are in their mid-30s, great looking and have a successful counseling practice complete with best-selling books and an Emmy®-nominated TV show. Ryan and Sebastian seem to have it all, but secretly their relationship is falling apart. They’ve been keeping up appearances to Sebastian’s sister Kai (Terri J. Vaughn) and her husband Rod (Darian “Big Tigger” Morgan), Ryan’s best friend Sidney (David Banner), their producer Paige (Nicole Eggert), Ryan’s editor Dale (Karon Joseph Riley), their patients, their fans and the public to save their lucrative careers – until one day when it all comes out. Now, Ryan and Sebastian have to decide whether their own marriage can be saved. (Sources: UP TV; IMDB).